Looking for something hatke for bae/BFF or fam member’s birthday or anniversary? Here are 5 home bakers who will make any special day sinfully delicious! We can’t stop raving about the Petite Baker’s cute cakesicles! She even makes them with messages on them and in flavours varying from chocolate vanilla to truffle. And you can order hampers which have an assortment of cookies, teacakes, cakesicles, dry cakes. If you already have something specific that you want, she is ready to bake cupcakes or cakes according to your order as well. With a small delivery fee, she will deliver your order to your doorstep! You should definitely try out homebaker Parwati Ladha’s amazing cupcakes in a variety of flavours, perfect for those who aren’t very fond of chocolate. For INR 60, you can customise and personalise them to suit preferences. Bubblegum, saffron and pistachio, zesty orange, mojito, orange cranberry and just a few of the out of the box flavours she offers. Her cookies, puddings, cakes are also available in these flavours. Contact her at +919830963104. This budding homebaker was always interested in baking. Encouraged by her family and friends she finally started taking orders last year. Stuti bakes cakes according to your needs. From red velvet to mango to Nutella moussecake she has decandent eggless desserts that are perfect for anyone with a sweet tooth. You can call her at 9051447686. Currently studying in St Xaviers, this young home baker makes cupcakes, dry cakes and the very popular wreaths and drip cakes. Baking has always been something she is interested in and she started taking orders a few months back. Cakes with coffee or fruit fillings are right up her alley. You can call her at 9831418293. 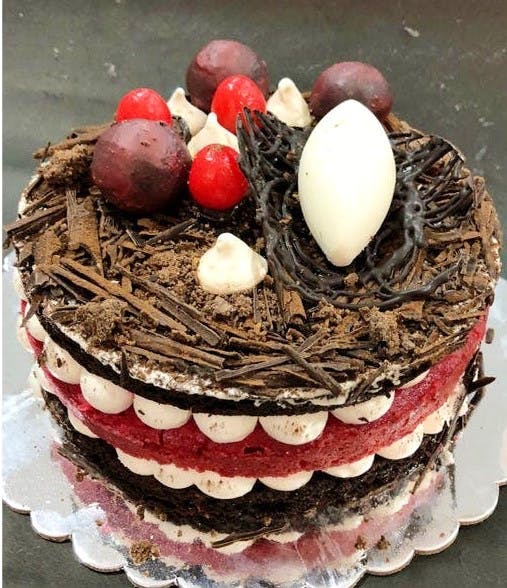 Started By Harshita Mundra, Ovenly is a gourmet kitchen which has curated menus for many restaurants and has some of the best desserts in town. So if your mother loves chocolate cakes and profiteroles this should be your go-to place. If mangoes are your mothers favourite, go ahead and order some mango profiteroles or the rich mango cream cake. Contact her at +91 98307 79962. All of these homebakers take orders at least two days in advance.